I stumbled across this beautiful photo (here), during my blog travels. 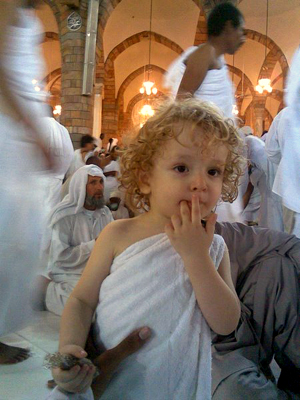 māshā’Allāh, ain't he the cutest? Combined with an equally adorable pic over at OM's blog, it's enough to turn one broody… eep! Quick! Someone talk about drag racing, football, motorcycles – anything! I'm about to drown in my own oestrogen! hahaha. Those kids are cute. For some reason I love admiring children from far away, I don’t think I can ever handle my own. Not sure why I think this way! To be honest, i don’t think i can get that broody, after witnessing first hand the burdens of bringing up little babies. It’s not that i’m totally put off – i just know that it’s hard work, so i’m not about to rush into it with naive ideas of “coochy coo”. I’m not sure that my last sentence made sense. Perfect solution to broodiness is to stand in line in a supermarket behind some small child throwing a tantrum because mum has said they cannot have a sweet. The best contraception there is.